Developed over twelve months in total secrecy, Mind Candy launched their awesome new online game called World of Warriors. 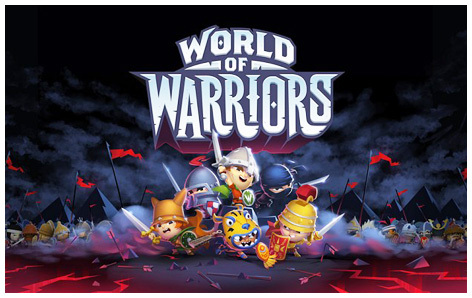 No little cuddly Moshi Monsters here – just a bunch of warriors from around the world who all want to FIGHT! Featuring historical battling characters such as Romans, Samurais, Mamluks, Hittites, Celts and Aztecs, this game is set to take the world by storm. Unlimited possibilities exist for World of Warriors toys to hit toy shop shelves throughout 2015. Topps were one of the first companies to be named as an official partner of this fantastic franchise. Their expertise in creating something special for Moshi Monsters and other hot brands ensures that their trading cards and albums will be the most innovative ever seen. Their rare ‘Hero’ cards are guaranteed to give game players an extra advantage over their opponents. Fans of Moose Toys’ creations were thrilled to hear that the company won the hard fought battle to be the licence holders for a range of World of Warriors toys and collectables. Action figures, vinyl figurines and real-life playsets featuring scenes for the game are certain to part of the product line-up. UK customers are in safe hands knowing that Flair (part of the Giochi Preziosi Group) are the UK distributors of these awesome toys. What youngster wouldn’t want to collect their favourite characters from this extraordinary online game? With 120 warriors to choose from, picking which one to buy first will be a big problem! Maybe Assyrians, Ninjas, Commanches or Mauryans will hit the mark – if not try Vikings, Gladiators, Apaches or Kievan Knights. Flair are supplying the figures in packs of 2, 4 or 8 characters and kids can swap between each other if they get any duplicates. The Deluxe Action Figures are sure to be in great demand as kids snap up these detailed toys of their favourite characters with lots of working features. Hero product line is the awesome Battle Arena Playset where kids can recreate their favourite fight scenes from the game. Flair also have role play accessories available such as shields, swords and face masks. Initially launched on iOS and Android mobile device platforms, the game was an instant hit and went straight to the top of the app charts. Keep up to news with all the official and unofficial on the World Of Warriors toy blog. Described as an “epic combat strategy game with a unique skill element drawing from history’s greatest warriors”, there’s no doubt that World of Warriors is a massive global hit. Mind Candy has come a long way since first launching in 2004. The first project was known as Perplex City. A modest success, it was back to the drawing board for the 2008 hit Moshi Monsters. By 2014 the game had a registered user base of 80 million players. Several spin-off titles were created such as Moshi Karts. The hit Moshi Movie and own brand Poppet character ensured that kids were captivated by this extraordinary licence. 2015 sees a massive roll-out of merchandise based on the characters in the game. Products not only include trading cards, toys, collectable figures and exciting playsets. Ranges of clothing, magazines, comics and books are also rolling down the production lines.